If your looking for that perfect scone to make during the fall apple season then Apple Oatmeal Scones with Caramel Glaze is the scone recipe your looking for. 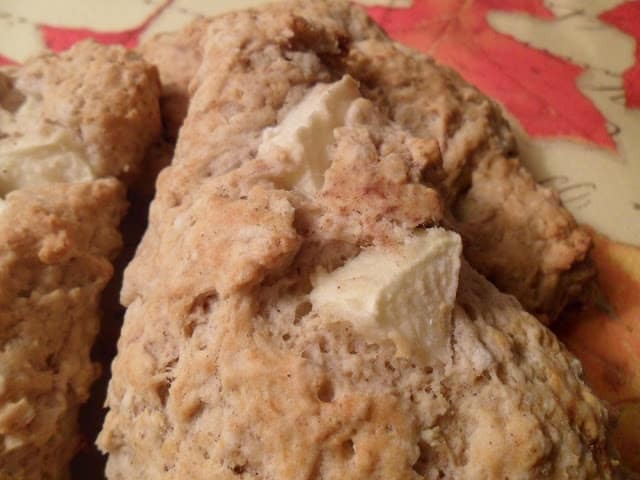 The scones are made with fresh chopped apples, oatmeal, apple pie spice, applesauce and apple juice. This scone recipe has a very “wet” batter, making them super moist. The caramel glaze is definitely the cherry on top. This recipe for caramel glaze is super easy and delicious. Made with brown sugar, butter, corn syrup and powdered sugar. 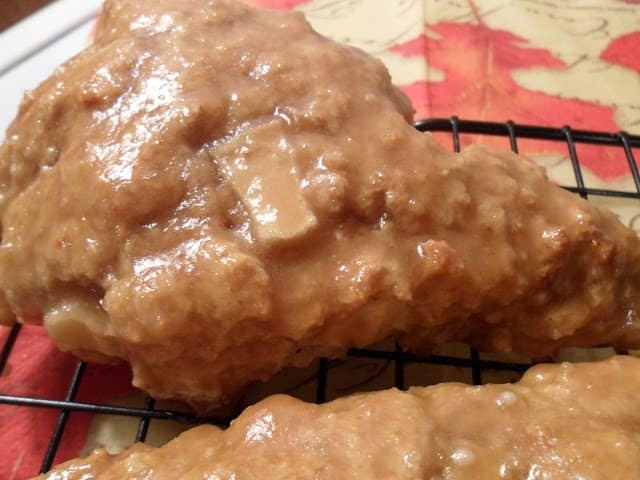 Caramel glaze would be delicious on everything from apple cookies to apple bars. Apple Season is right around the corner so put this recipe in a safe place. In a few months you are going to want to make Apple Oatmeal Scones with Caramel Glaze over and over. 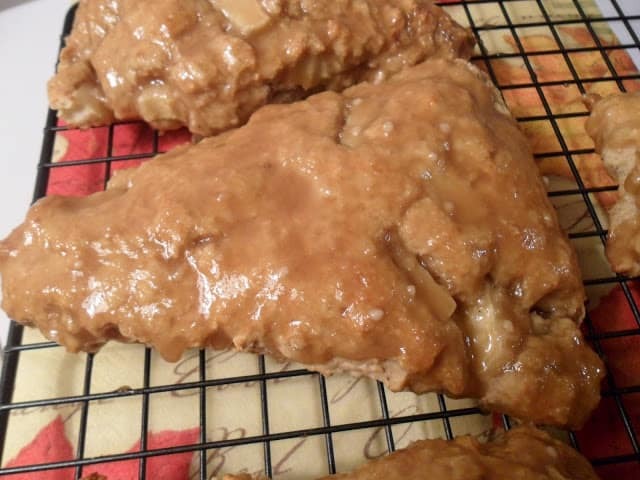 Make Apple Scones with Caramel Glaze during the fall when apples are abundant. In large bowl combine flour, oats, sugar, baking powder, baking soda, salt, and apple pie spice. Cut in butter until mixture resembles coarse crumbs. In small bowl combine applesauce, milk, and apple juice. Add milk mixture to flour mixture. Stir together. Fold in diced apple. Bake scones for 12 to 15 minutes or until golden brown. Remove from baking sheet. Cool on wire rack. Melt butter, brown sugar and corn syrup over medium low heat. Heat until butter melts and sugar dissolves. Remove from heat and stir in vanilla. Add powdered sugar. Whisk in enough milk to make a smooth glaze. To save time, you can also purchase a caramel ice cream topping. Heat the sauce for a few seconds in the microwave and drizzle the warmed caramel topping over the scones. Our favorite brand for this is Ghirardelli. Here are a few of our favorite recipes that are great to make during the cooler fall months; Oven Crispy Haddock Easy and Delicious, Light and Airy Cinnamon Rolls and Pumpkin Spice Chocolate Chip Scones.